All research in the O'Grady Laboratory attempts to address the broad question: how did present-day biodiversity evolve? We take an evolutionary approach and employ a wide range of techniques including alpha taxonomy, morphology, biogeography, molecular population genetics, molecular phylogenetics, and genomics. Hawaiian ecosystems are especially good models for biodiversity research because they are closed systems that have evolved in isolation over millions of years, creating a natural laboratory for evolutionary studies. Ongoing projects in the lab examine the pattern and process of diversification in a number of endemic Hawaiian insect lineages to better understand not only how these groups formed, but how they may be preserved. For example, studying population genetics (estimating migration rates, ancestral population sizes, and other historical factors) in a recently evolved group of Hawaiian Drosophila allows us to directly test hypotheses concerning mechanisms of species formation. It also gives details on population connectivity and effective population sizes that are useful to conservation managers. Recent human disturbance and global climate change are threatening fragile Hawaiian habitats and driving many species to the brink of extinction. Understanding the conditions required to create biodiversity may yield insights into how species and habitats may be conserved in the future. With an estimated 1000 species, the endemic Hawaiian Drosophilidae account for approximately one quarter of the world's projected drosophilid diversity (Kaneshiro 1997) and serve as my primary research system. This clade is divided into two major lineages, the Hawaiian Drosophila, all of which are found only in the Hawaiian Archipelago, and the genus Scaptomyza, a group containing both Hawaiian and continental members (Throckmorton 1966). The Hawaiian Drosophila lineage is characterized by spectacular sexually dimorphic modifications of the mouthparts, wings, and/or forelegs (below). The Hawaiian species have evolved within the past 25 million years on only 0.01% of the earth's land area (DeSalle 1987; Carson 1992). Extreme isolation, as a result of divergent mating behaviors, sexual selection, high host plant specificity, and numerous habitats and microhabitats generated by diverse geographic and climatic patterns present within a small region, is no doubt partially responsible for this diversity (Kaneshiro & Boake 1987). Ongoing projects in the laboratory are addressing phylogenetic relationships across all Hawaiian Drosophila, as well as within specific groups, the evolution of secondary sexual characters and ecological associations, and taxonomic revisions of various endemic lineages. We have recently published several phylogenetic studies dealing with relationships among the major lineages of Hawaiian Drosophila and between closely related taxa in various species groups of Hawaiian Drosophila. The phylogenetic trees we have generated are useful in understanding a number of aspects of the life history of these flies, including the adaptation to specific host plants and biogeographic patterns seen within these species. 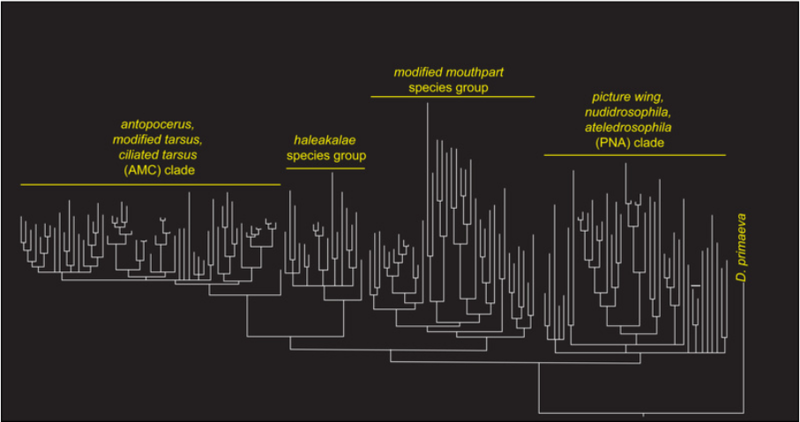 Phylogenetic relationships among major lineages of Hawaiian Drosophila, after O'Grady et al. (2011). In an effort to better understand the diversity present in Hawai'i, we have begun to systematically revise each of the major species groups in the Hawaiian Drosophila lineage (Hardy et al. 2001; O'Grady et al. 2001, 2003a; 2003b; Magnacca and O'Grady, 2006; 2008; 2009), resulting in over 80 new species descriptions. A synthetic treatment of all Hawaiian Drosophilidae, as well as a revision of the genus Scaptomyza, is currently underway. Mouthpart modifications in the Hawaiian Drosophila. Modifications to antennae, forelegs, and terminalia in Hawaiian Drosophila. We have also recenntly started to examine some mating behaviors in Hawaiian Drosophila. This includes male-female interactions during courtship and male-male interactions during lek formation. This work, while preliminary, is giving us insight into the evolution of complex behaviors and female choice in Drosophila. The Hawaiian Drosophila are a textbook example of adaptive radiation. In spite of the large amount of research on this model group of species, they represent only a single colonist event and it is likely that generalizations made on this group may not apply to other lineages. This NSF funded project attempts to compare the pattern, time and rates of colonization and diversification in other groups of Hawaiian Diptera to those known from Hawaiian Drosophila. My lab, including postdoctoral fellow Dr. Kari Roesch Goodman, is collaborating with Neal Evenhuis (BP Bishop Museum) and Brian Moore (UC Davis) on this research. This work will not only provide a better understanding of the patterns and processes leading to adaptive radiation in Hawaii, but will also teach us about rapid species formation on other island systems. We have recently initiated phylogenetic projects on the Calliphoridae (Dyscritomyia), Dolichopodidae (Campsicnemus and Eurynogaster Complex), Limoniidae (Dicranomyia), and Ephydridae (Scatella). Outside of the Hawaiian Diptera, Gordon Bennett's Ph.D. research focuses on Nesosophryne leaf hoppers. All of these focal taxa differ from Hawaiian Drosophila in several key characteristics, including size of radiation (12 to 1000), larval habitat type (terrestrial, freshwater stream, brackish water, marine), degree of sexual dimorphism (none to highly elaborate morphology and courtship behaviors), and degree of single island endemism (~20% to >95%). Our work in the endemic Hawaiian craneflies (Limoniidae: Dicranomyia), suggested that some aquatic taxa may be far more vagile that Hawaiian Drosophila, easily dispersing from island to island. Mycodrosophila is a cosmopolitan genus and to date nearly 130 species have been described. Although the center of diversity of this genus is the Australasian region, McEvey and Pollak (2005) report that about 20% of the described species are endemic to the Pacific. We have, in collaboration with Shane McEvey and Michal Pollak, begun to build a phylogeny of Mycodrosophila to examine biogeographic patterns in the Pacific and understand the evolution of reproductive characters. The lab is actively working on the phylogenetic relationships of the sister clade of the Hawaiian Drosophila, the genus Scaptomyza. This genus is a fascinating group that has, at several independent times, dispersed to some of the most remote island systems in the world. Over 70% of Scaptomyza species are single island endemics (Wheeler 1981; 1986). 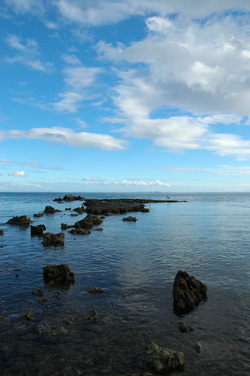 The greatest diversity of Scaptomyza occurs in Hawai'i, where nine subgenera, accounting for over 50% of the species-level diversity in this genus, are endemic. 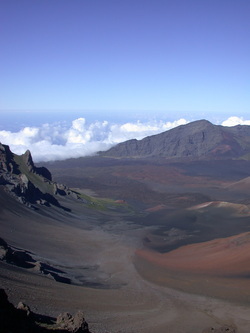 One subgenus, Elmomyza, has undergone a large radiation of nearly ninety described species in Hawai'i. Some members of the remaining subgenera, accounting for about 120 known species, have also undergone "mini radiations" on various island systems, including the Tristan da Cunha complex, the Galapagos, and the Bonins. Drosophilidae is one of the largest and most intensively studied families of acalyptrate Diptera, and Drosophila, with nearly 2000 described species, is the largest genus in this family. Recent work suggests that this group is not monophyletic (Remsen & O'Grady, 2002). The difficult in inferring relationships within this family is probably because this genus underwent a high rate of diversification 50-60 million years ago, roughly coincident with a great deal of ecological adaptation (Markow and O'Grady, 2005). The placement and monophyly of another large rapidly evolving group, the Hawaiian Drosophilidae, is also in question. Although all molecular analyses, as well as the combined molecular and morphological analysis, support the monophyly of the Hawaiian Drosophilidae and its placement as sister to the subgenus Drosophila, some morphological studies suggest that these taxa are not closely related. We are currently using a high throughput approach to generate sequences from about 50 nuclear gene regions, as well as a large portion of the mitochondrial genome, to infer unresolved evolutionary relationships in the family Drosophilidae. These data will be used to test the monophyly of the subgenus Drosophila and examine the placement and monophyly of the Hawaiian Drosophilidae. Like the research that you're read about here? Please consider supporting this work by making a small donation. Click the button to the right for more information.